The perennial runt of the litter, Jubilee's never had a fair shake from anyone: her family, her teammates, her readers… even her life. Perhaps most distressingly for the young former Generation X'er, that trend doesn't seem to be changing course. De-powered by the Scarlet Witch along with most of the mutant race on M-Day, Jubilee felt isolated just hanging out with her former teammates, despite their assurances that she was still a part of the gang. Now infected with vampirism after a surprise attack on Utopia by Xarus, the son of Dracula, she's been completely ostracized from her closest friends, physically as well as emotionally, while they try to figure out where to go from here. What the whole of this issue boils down to is the entire team trying to walk softly around their newly fanged adolescent teammate. Most of the school is trying to work out a way to avoid upsetting her, while at the same time coping with their own sense of innate uncertainty and learning to trust that she won't appear at the foot of their bed in the moonlight with that glint of shadowy hunger in her eye. Thus far, though, the only one who's managed to set aside their feeling of distrust is Logan, with whom she'd already developed a special student-mentor relationship. Some of her former teammates do a better job of masking their emotions than others, but there's a palpable sense of unease that presents itself the very moment she walks into a room, which Jubilee herself doesn't do much to dismiss with her frequent, angry outbursts. There's probably a decent story in here somewhere, waiting to be unearthed, but Wolverine and Jubilee is taking the long way there. So much time is spent treading water, waiting for all the talk and time-killing to give way to genuine development, that by the time the plot actually does manage to take a step forward, the back cover is just a page turn away. Kathryn Immonen gives her characters some halfway decent dialog this month, but her story structure leaves a lot to be desired. Phil Noto's subdued, character-focused artwork is the true star of the issue, and while he doesn't get much of a chance to stretch his legs with any particularly interesting panels, his work in the snail-paced establishing pages really shines. I think I'd have abandoned this book around page ten without a better-than-average artistic showing, and Noto kept me reading to the final page. If he can work this kind of magic with a dull, stagnant storyline, his artwork should be a genuine spectacle when he gets something really juicy to sink his teeth into. I kept waiting for the establishing shot of this mini-series to go somewhere, but it never delivered. Page after page, I was flooded with repetitions of the same central theme: Jubilee feels unhappy, her schoolmates don't trust her. Yes, that much was conveyed in the opening blurb inside the front cover… why don't we get some traction and move forward on that theme? 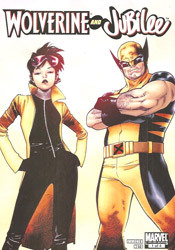 Wolverine and Jubilee isn't awful, but it is terribly redundant and over-cautious, a running-in-place waste of good artwork. Flip through it for the visuals and skip the word balloons.